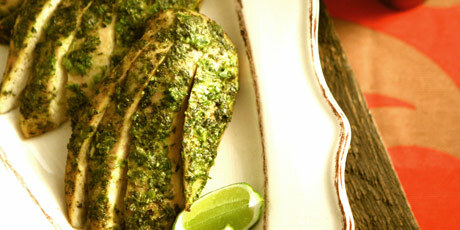 Juicy chicken breast seasoned with fresh herbs, spices and a hint of lime. You might also like Anna Olson's Best Sunday Night Suppers. 1. In a food processor or with a mortar & pestle, purée green onion, garlic, thyme and oregano with salt and olive oil until finely processed. Stir in ginger, allspice, black pepper, nutmeg and chili (if using). 2. Coat chicken breasts with herb mixture, cover and chill for at 30 minutes to up to 1 day. 3. Preheat oven to 375°F. Place chicken breast on a parchment-lined baking tray, be sure to spoon any excess herb mixture on top, and roast, uncovered, until cooked through and juices run clear when cut, about 25 minutes. Slice and serve warm or a room temperature, sprinkled with lime juice. 4. Alternately, chicken can be grilled over medium heat, turning once during cooking, about 25 minutes.